Editor’s Note: A version of this post originally appeared on Social Media Explorer. I’d like to walk you through a social media strategy concept known as the homeland-embassy approach. It’s an idea shared first by Steve Rubel, though I’m not sure he meant to take it as far and as literal as I’m going to here, but the basic gist is that your website is your homeland and your social networking accounts are your embassies. 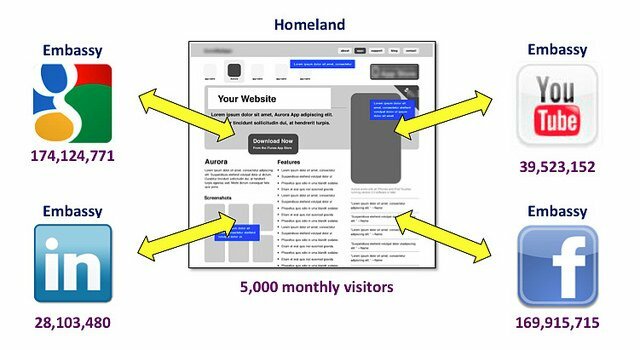 Before we delve into the nitty-gritty of the homeland-embassy strategy idea and what it suggest strategically about how you execute, lets take a minute to acknowledge the importance of proximity or where the online social engagement transpires. Is it okay for a company or brand to engage on Facebook, Twitter, and Linkedin but be antisocial on their own website? Or do they need to socialize their homeland as well? Dell saw the advantage to controlling the venue where the conversation occurred but not so he could censor it. He knew that by hosting the conversation on his own site, whether the discourse was positive or negative, and allocated staff to respond, he was able to sell against those conversations. He could use that content to draw in more traffic, and more traffic meant more sales. He also built trust by willingly debating his critics in public. He realized economies of scale by organically transferring organizational intelligence to the web where it could be found through search and shared through social media, ultimately deflecting costly inbound call center queries. The importance of proximity is huge. We don’t have that advantage on a social network. We may get to use Facebook for free, but our competitors can buy ads against our conversations. We can’t even buy out the ads that appear alongside our posts. The option just doesn’t exist. When we engage prospects and customers, we need to be mindful that it’s always going to be easier for competitors to siphon away our traffic on Facebook than from our own site, where we control the layout and the conversation opportunities. On your own website, you lure new visitors with content. As long as the content intersects with their interests, you can present click-through options in the sidebar that generate leads, capture email registrations and drive sales. On your own website, you are in control of the user experience. That’s why your website is your sovereign nation. It’s your homeland. Your Facebook Page, on the other hand, or your Twitter feed, are more like embassies. When a country has an embassy in a foreign country, diplomatic immunity aside, it must abide by the local laws of the host nation. Facebook and Twitter are also sovereign nations. You’ll find the laws of those lands in their Terms of Service. Violate them and they can export you anytime. If your host country is hostile to your foreign policy, you’ll need extra security support at that embassy. Just as embassies get hijacked, Facebook Pages get brandjacked. You need a plan for what do in the event of an unforeseen crisis, and you’ll need to staff your embassies with people who understand the local customs of the social networks you decide to settle in. In most embassies, the majority of employees are local hires. They guide Foreign Service Officers through the local laws and customs of that culture. We need to do the same thing on social media. We must appoint representatives who understand the way things get done there as well. The US has embassies all over the world, and some in nations where they may not look favorably on all of our foreign policy decision. Still, if there are social, economic or political reasons for us to be there, we’re there. The same is true of social networks. There may be companies that create products and service that others think are irresponsible. But that doesn’t mean they’re not represented on social networks. After all, there’s always going to be more traffic on Facebook and Twitter than there is on your own website, and that’s important to even the most despised organizations. The most popular page on most US Embassy websites is the “Visas” page. If you’re issued a Visa and you visit the US, you’re going to spend money, and you may have good memories to take that experience back home and share with others. That’s good for the US. Marketers issue Visas on social networks all the time as well. We do it by posting links to Facebook and Twitter that transit visitors to our destination website. The last thing you need to know to execute a homeland-embassy social media strategy is that it’s critical to actually embed the activity occurring in the embassies on your homeland. By doing so, you’re using social media to advocate on your behalf to all direct visitors to your homeland. What’s the value of a few thousands Facebook friends or Twitter followers? Not much if they’re not visible beside the conversation opportunities on your website. One simple link from your homeland to your embassy doesn’t suffice. You need to learn to make your social networking activity visible on your own website. Integrate your Facebook Page into your website with a like box along the lead generation button. Got an impressive following on Twitter or your Linkedin company page? Embed tweet buttons and Linkedin buttons and use follower count bubbles as social proof that you’ve got advocates. If you upload images and videos, embed a Flickr Gallery and a YouTube Channel Widget so the content is available on your homeland as well. You don’t have to be a techie to master embed codes. If you want help, I made a self-paced, online course called Social Media for Business that walks you step-by-step through the process of executing the homeland-embassy strategy. Social Media for Business is actually the first of six online social media courses that make up my Online Social Media Bootcamp. The others are Social Media Monitoring, SEO Training, Facebook Training, Twitter Training and Linkedin Training. If you’re interested in all six, they’re sold as a discount bundle here. If you’re interested in a group license to accelerate enterprise wide digital literacy, you can get bulk pricing here. What do you think about the homeland-embassy strategy concept? Is it something you think would work for your organization? Are you doing something similar already? Or are you pushing the envelope even further with another approach?